What started as a simple web search on Google late one evening led to a series of events that no one could have possibly envisaged. The V-SOL Web Site is our window into the world. It brings enquiries from just about every country and we pride ourselves on providing every enquiry no matter where or who it comes from with an appropriate response. At V-SOL David Isom the Managing Director makes a point of reading every enquiry email. This day he noticed that there was a private enquiry from literally just around the corner. It came from a Mr David Shepherd an enthusiastic stepfather. Davids stepson Jamie had been discussing with his dad the previous evening his progress with a school science project. The project was based around the production and launch of a rocket. Jamies school is Mount St Joseph in Bolton and along with 4/5 other schools were involved in a competition, the "UK Aerospace Challenge" that would see the winning team take a trip to Russia to compete against Russian schools in the "Space Olympics"
The theme behind the entry for Mount St. Josephs RC High School was a rescue rocket. 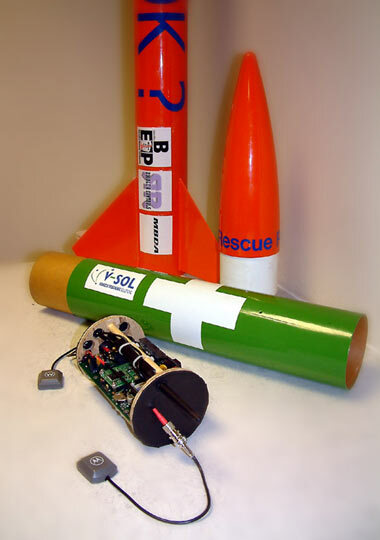 The team had the idea of delivering a small payload to help a person in trouble. Jamies father knew a little about Satellite Tracking via some experience with a GPS handheld device. His search on the web was to find out if it would be possible to use GPS in some way to help the school with the competition. Jamies father contacted V-SOL through a contact form on the web site. V-SOL Telematics systems are designed for use in motor vehicles. They are used for the location in real time of vehicles along with the ability to record journey and other information. The opportunity to help the school and the children learn about the technology along with the chance of launching our telematics device in a rocket was a temptation that the development team at V-SOL could not resist. The challenges were many but probably the biggest was a deadline of less than three weeks before the rocket was due to be launched. V-SOL could not really spare the time needed but every member of the team wanted to help and agreed to give up whatever of their time was necessary, for the next three weeks staff worked frantically on the challenge of adapting our vehicle technology for flight. 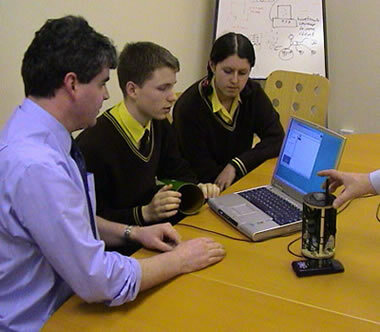 The technology teacher from the school Mr Paul Abbott had been working with the children for months on the project. To bring the young scientists up to date we held a GPS workshop at our offices. The other businesses in our complex got quite a shock when a busload of school children turned up on the doorstep. Most of the initial work on the project was carried out by V-SOL but as the day of the launch grew nearer the school became more involved in the final details. The hardware issues that we were concerned with were that of size, weight, power supplies, extreme G force, and antenna issues. Motorola manufactured the GPS receiver in the unit and whilst being the latest in technology with a high specification its design specification did not include rocket velocities. John Storey the V-SOL Product manager developed a lightweight housing with extra shock absorption and also created a special battery pack for the unit. Roy Schofield, our embedded systems specialist provided a custom version of firmware especially for the flight. On the day of the flight we travelled to the launch site, an isolated farm in Lincolnshire. 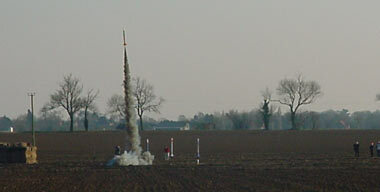 The rocket launches were made under the supervision of the United Kingdon Rocketry Association. Special clearance for flying the rockets was also required. BBC News covered the event and featured the Mount St Joseph entry. During the launch the flight was monitored via a isdn cellular link which was broken when the rocket reached a height that required the unit to be disconnected from the network as the radio transmission could have caused interference to aircraft. The onboard computer recorded the flight itself and the telemetry trace was used to assist the team in their efforts in the competition. When the judges had deliberated over the result it was decided that the team from Mount St Josephs were the overall winners. The awards ceremony was attended by David Guest from the BBC who presented the team with the UK Aerospace Challenge Trophy. 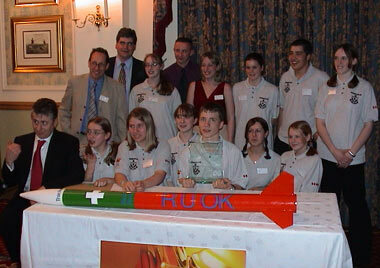 In addition to winning the trophy the team are going forward to represent the UK in the Space Olympics to be held in Russia in October 2003. The children and teachers will visit the Russian space centre and will have the chance to speak to cosmonauts on the Mir Space Station. 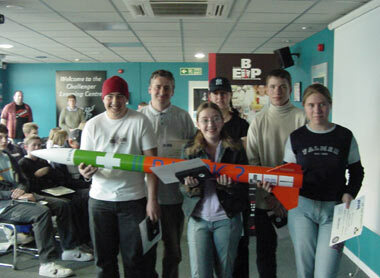 V-SOL were proud to help and have also achieved the first recorded flight of a rocket using GPS. The Motorola GPS receiver also operated way beyond it's defined limits to allow the entire flight to be recorded in spite of the G forces incurred. "The team wanted to use rocket and missile technology to get a rescue payload as close as possible to a person in distress. My students gave all their free time at school and at weekends to finish the project but without V-SOL it would not have been possible for them to know the position of their rocket, nor to collect the data they needed to bring their rocket within their target area. It has been wonderful to work with V-SOL, and with adults who are as entusiastic about science and technology as we are. The team will never forget the sense of excitement and achievement when our rocket soared into the air, and when it became apparent that the technology developed by V-SOL worked perfectly. What a triumph." the United Kingom Rocketry Association website.